It has been a good few millennia, sure, but our love affair may have been a little rushed. After all, what do we really know about the ocean? Roughly 95 percent of it remains unexplored, and it seems as if every other day we're finding out something new and unsettling. The frilled shark is one of the oldest living species on the planet. Maybe it's time we Homo sapiens re-evaluated our relationship with the oceans of the world. 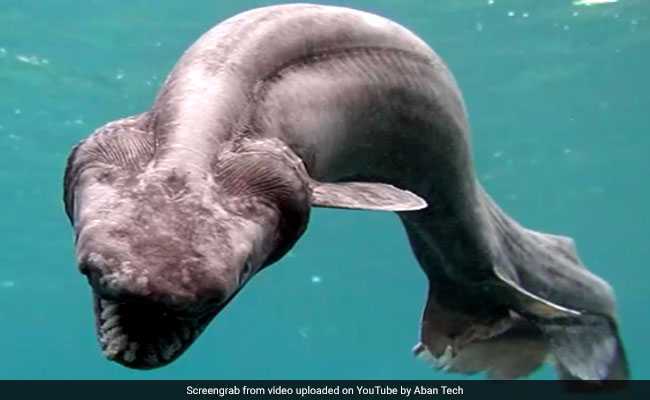 "Prehistoric, Dinosaur-Era Shark With Insane Teeth Found Swimming Off Coast of Portugal"
That sea-dwelling, serpentine conglomeration of nightmare fuel is the frilled shark, one of the oldest - and in the running for the creepiest - living species on the planet. Its prehistoric contemporaries, like Tyrannosaurus rex and triceratops, died out long ago, but the frilled shark is still swimming around deep below the surface of the world's oceans, scientists say. They know that because of an accident that sounds vaguely like the plot of a straight-to-video horror movie. A group of European Union scientists were trawling the depths of the Atlantic Ocean this month, trying to figure out a way to "minimize unwanted catches in commercial fishing," according to the BBC. Instead, they ended up capturing one of the rarest and most ancient creatures on the planet, one that may have inspired 19th-century tales of "sea serpents." What those sailors didn't know was that the frilled shark has looked pretty much the same since the breakup of Pangea. Mainly, that look is horrifying. The largest can grow 6 feet long - the size of a tall man. The shark is named after its gills, which have frilly, fluffy edges, but the cuddly factor ends abruptly there. Inside its short-snouted head are 300 more reasons to never go farther than the beach: hundreds of needle-sharp teeth, neatly lined in 25 rows. It uses quick lunges to sink those teeth into other sharks, fish, octopuses and squid. Humans know very little about the frilled shark because it lives deep in the ocean, off the coasts of Japan, New Zealand and Australia. In its 80 million years on the planet, it has rarely come into contact with humans or been seen or filmed in its natural habitat. Clearly freaked-out 19th-century sailors were the first to write about it. The frilled fish has a remarkably simple anatomy, probably because of a lack of nutrients in its aquatic environment. But there's no definitive answer about why it outlived its Cretaceous Period contemporaries. So for now, it remains one of those increasingly frequent reminders that some of the creepiest beings in existence are floating beneath what appears to be a serene ocean surface. From time to time, scientists will set out to see what's swimming around in unexplored regions of the sea, then use the internet to show the world what got tangled up in their nets full of nope. For example, earlier this year, an international team of scientists sponsored by Australian museums pulled up some creatures from more than two miles beneath the ocean. They wanted to see what kind of animals live where there is perpetual darkness, crushing pressure and inhospitable temperatures. They found things like a red crab covered in dozens of thorny spikes that would be quickly sent back to the chef at Red Lobster. And they discovered a coffinfish, a blue-eyed, red-finned trickster that uses "a fishing rod tipped with a fluffy bait on top of its head" to lure prey close enough to snag. So, yes, maybe the beach is the safest place until we know more about what's swimming around in the great beyond. On second thought, even that may be too close. As The Washington Post's Lindsey Bever reported in September, the high winds and heavy rains of Hurricane Harvey washed "a mysterious sea creature with fangs and no face" onto the shore in Texas. Even the internet struggled to identify what it was. But one thing is certain: Clearly it's time to re-evaluate our relationship with the beach.